Nice! Is it worth doing some advertising signs, nameboards, noticeboards etc to go with the building? Possibly on any unutilised space on the paper. I'm planning to do separate sheets of posters etc. for different countries and periods. I hope to come around to them somewhere this century. Putting posters on these sheets doesn't work too well, paper's too thick, that shows. Doing some sketching for a paper model bunker. I think this one shows the thickness of the concrete well. This one is planned around the dimensions of a PAK-40, a WWII German anti-tank gun. Something popped up in my computer tonight, at closer inspection it seems to be a template for a Wild West shop. I figure to use it to make a few different shops in the near(ish) future. Yes, just need to change the fronts around with signboards etc. There seem to have been standard designs. 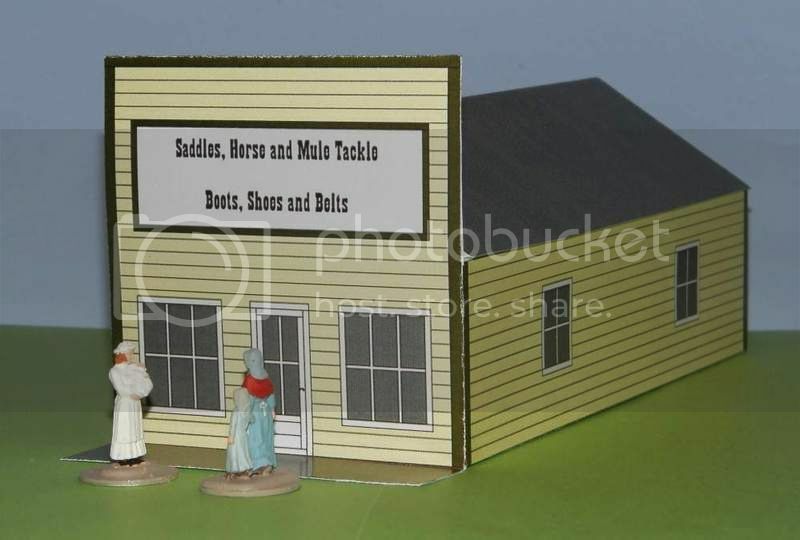 Finished the first of my Wild West shops. Eventually there will be more in this as well as other models. This one is in 1:72, but the series will also be available in all the usual scales from Z (1:220) to 28mm (1:56). Next: a smaller version. There will be some variations, somewhere in the future. But first, I'll have to fix the roof, it was too wide. 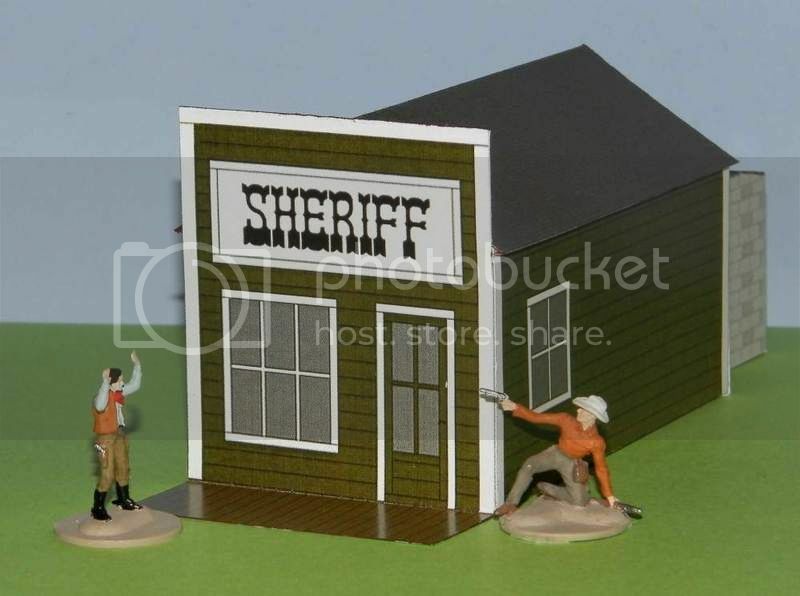 The sheriff's office is the latest addition to my paper Wild West project. This one is in 1:72, but it will be available in all current scales from Z (1:220) to 1:56 (28mm). The hands on the bars are a nice touch! The guy about to shoot Hitler will make all Gungnir's WW2 stuff redundant, though. Ronan the Librarian wrote: The guy about to shoot Hitler will make all Gungnir's WW2 stuff redundant, though. Hmm, there would still be an authoritarian right wing government in 1930's Germany, nursing a grudge regarding the 'stab in the back' to end WWI. There would still be Soviet Russia, diametrically opposed to a RW Germany, & Poland would still be stuck in the middle of those two. I fancy that Gungnir's kit will still get a work out. 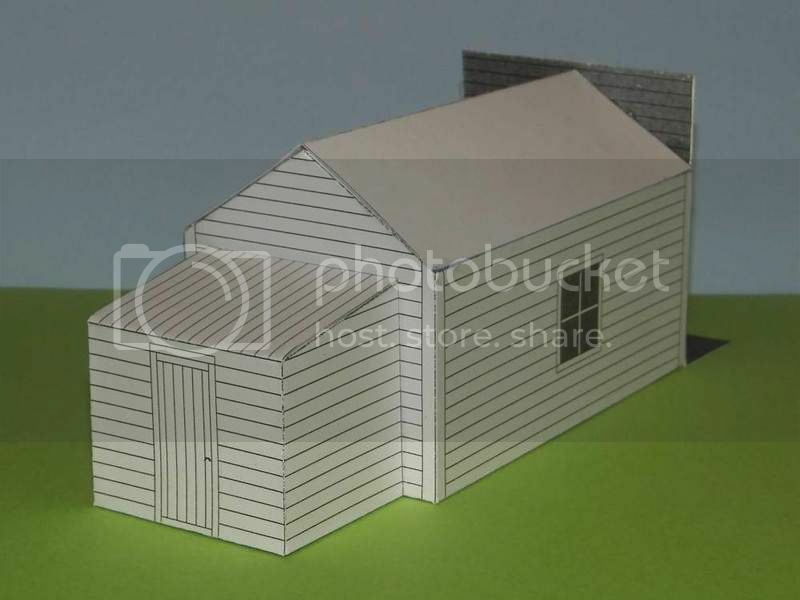 Finished a set of general purpose paper model outbuildings last night, suitable for a wide range of periods and locations. This set is in h0 (1:87) but there will be similar sets in other scales. Older members may remember how I started on a Buddhist school project last year. Finally got the detailed test build done. The reverse is conjecture, I didn't have any drawings of it, only floor plans. The lama it's meant for will be visiting Wildervank this week, so I can ask him if I conjectured kinda correctly. I'm happy to report that tonight the lama approved of the building. Next step: figure out a way to get the roof straighter, and make a coloured version as well. 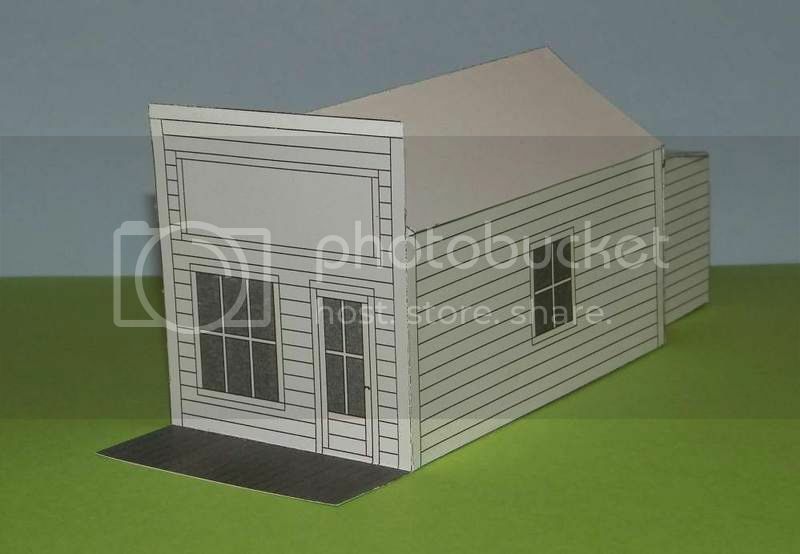 Been trying out a new shape for a house. 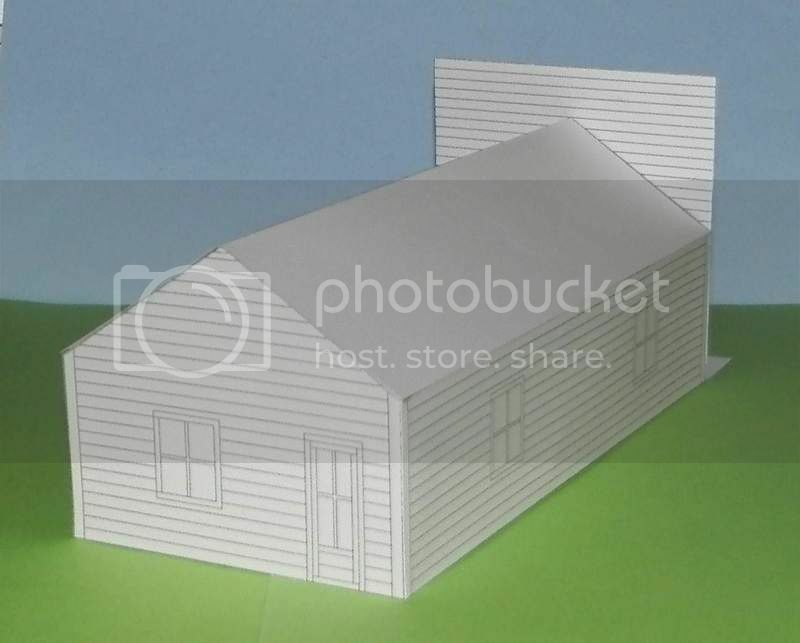 The shape of the new house model was a bit boring, so I added a bit to the side. I think I'll be adding a dormer window, and there will be two choices of gables. 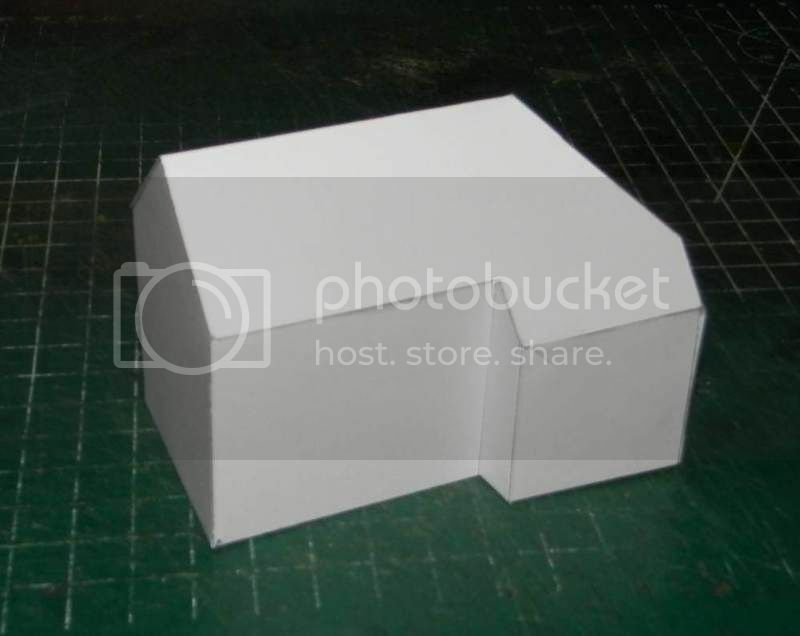 Latest paper building, to be added to our webshops tofay: detached house B. As the pics shows it may be built with either of the two alternate fronts. Loosely based on a few houses in my home town, Veendam. 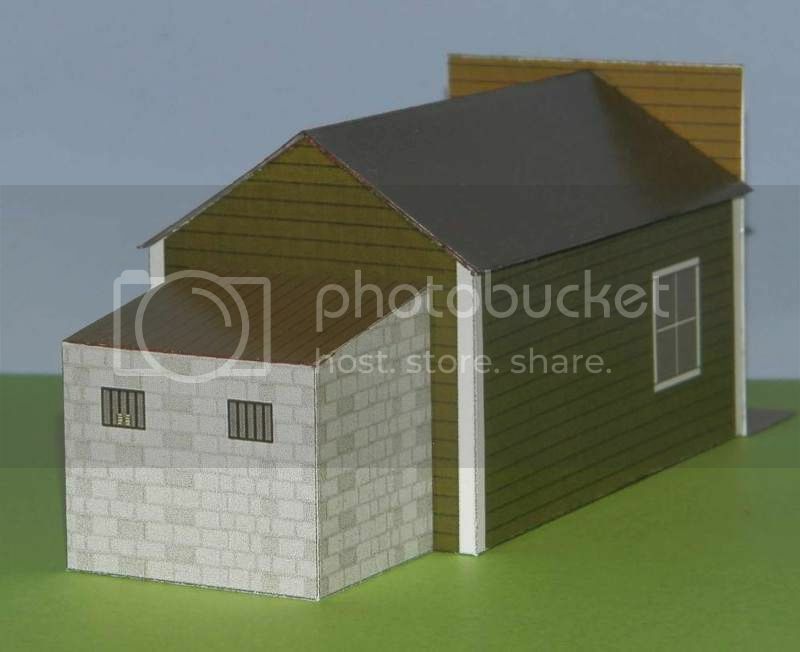 This one is in h0 gauge, 1:87, more scales will follow in due time. 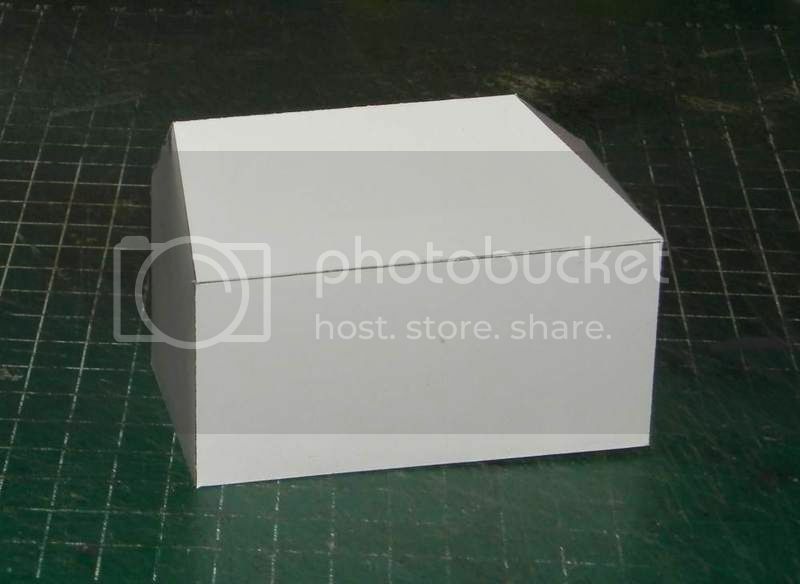 in h0 this model will cost a whopping €1,00. 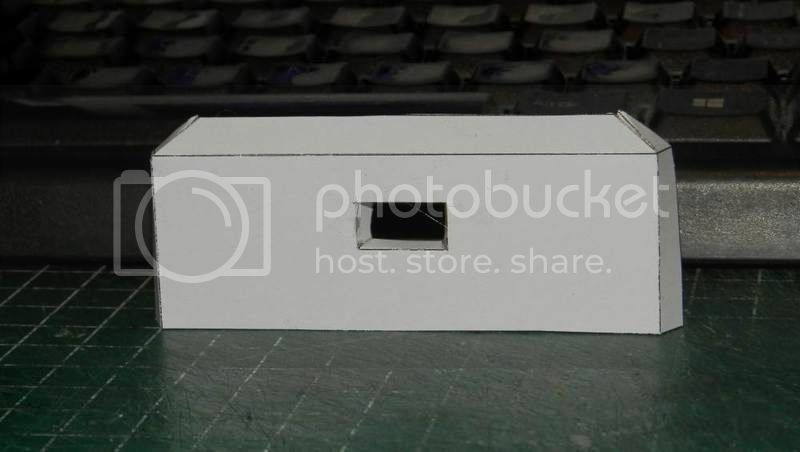 Started working on a new paper building. This one claims it wants to be a German railway station eventually. I see the bottom floor in brick, the two top floors as half timbered. Designing the roof will be fun. Not sure if it will be slate covered, or traditional German "beaver tail" roof tiles. First, the shape has to be right, then I'll worry about that. With four gables it's not going to be the easiest build ever, but the challenge is half the fun. 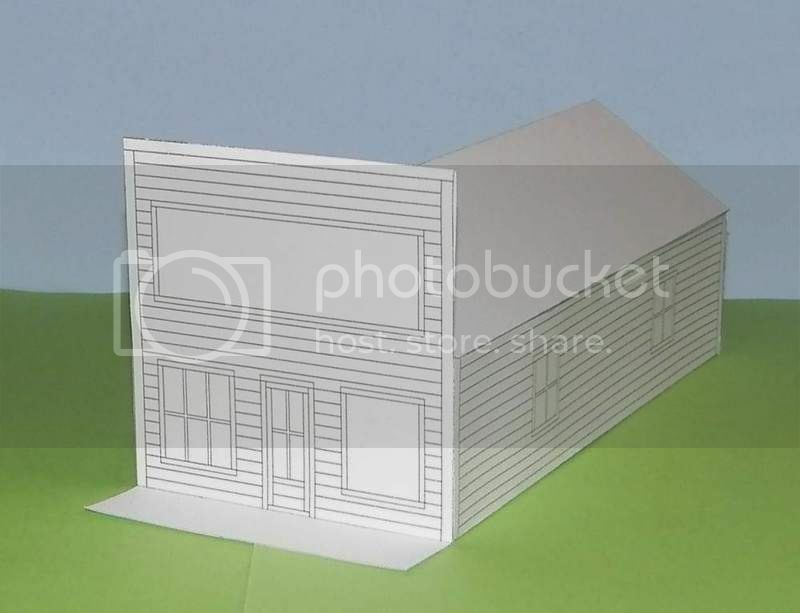 There will also be an extension, perhaps two, and an outbuilding. For the first time after injuring my shoulder, nearly two months ago, I dared to do some modelling again. Last night I drew what must be the smallest possible railroad station: just a waiting space and a service room. 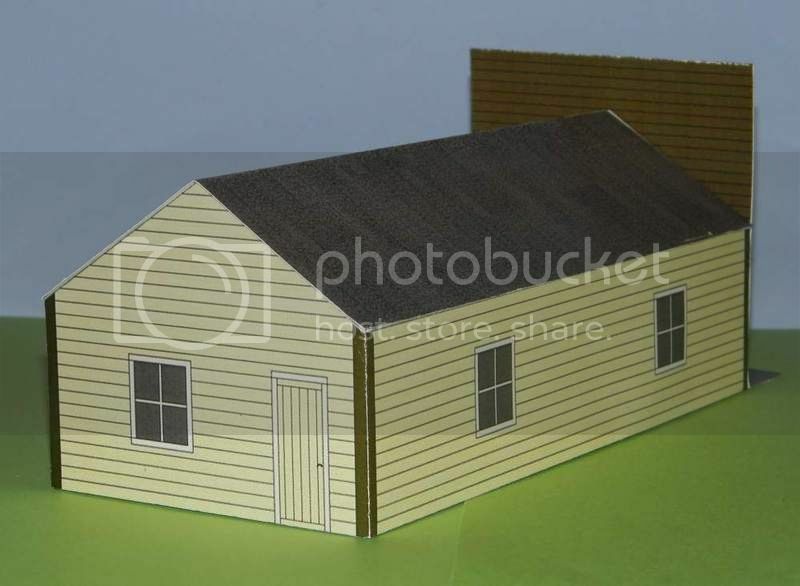 I think it will be finished as green planks, lighter green interior, corrugated roof. After this, I hope to be able to rekindle some of my bigger unfinished projects.